In Chess, Strategy is related to positional play and setting up goals and long-term plans for future play most importantly considering pawn structure and king safety. 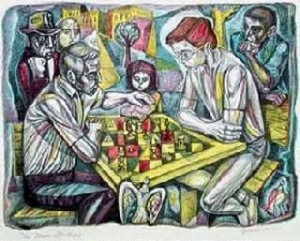 In computer chess, while tactics is the domain of search, strategy is almost the domain of evaluation. The concepts of strategy and tactics in chess and other sports are derived from military origins as defined as a fourfold hierarchy of strategy, operational objective, tactic and task. Gerald Abrahams: The tactician knows what to do when there is something to do; whereas the strategian knows what to do when there is nothing to do. Mikhail Chigorin: Even a poor plan is better than no plan at all. Aron Nimzowitsch: First restrain, next blockade, lastly destroy. The right to attack belongs to the side that has a positional advantage, which not only has the right to attack, but the obligation to do so, else the advantage will evaporate. The attack should be concentrated on the weakest square in the opponent's position. If in an inferior position, the defender should be ready to defend and make compromises, or take other measures, such as a desperate counterattack. In an equal position, the opponents should maneuver, trying to achieve a position in which they have an advantage. If both sides play correctly, an equal position will remain equal. The advantage may be a big, indivisible one, or it may be a whole series of small advantages. The goal of the stronger side is to store up the advantages, and then to convert temporary advantages into permanent ones. David Wilkins (1979). Using plans in chess. In Proceedings of the 1979 International Joint Conference on Artificial Intelligence, (Tokyo, Japan), pp. 960-967. Hermann Kaindl (1982). Positional Long-Range Planning in Computer Chess. Advances in Computer Chess 3, also published as Hermann Kaindl (1983). Positional Long-Range Planning in Computer Chess. Vienna University of Technology, Austria. Jonathan Schaeffer (1983). Long-Range Planning in Computer Chess. Proceedings of the Annual ACM Conference (Computers: Extending the Human Resources), pp. 170-179. Richard Korf (1987). Planning as Search: A Quantitative Approach. Artificial Intelligence, Vol. 33, pp. 65-88. Stephen Muggleton (1988). Inductive Acquisition of Chess Strategies. Machine Intelligence 11 (eds. Jean Hayes Michie, Donald Michie, and J. Richards), pp. 375-389. Clarendon Press, Oxford, U.K. ISBN 0-19-853718-2. John L. Jerz (2009, 2012). A Concept of Strategy Useful for Computer Game Playing.